10 Must Have Offline Messaging Apps for Your Smartphone. If you are off-grid or there is poor connectivity or for some reason network fails, how do you go about communicating with your family and friends? Though a simple and viable option would be to opt for 'Off Grid Communication Gadgets'; the additional hardware works along with your smartphone and lets you communicate. Then again you need to spend for these gadgets. Wont it be smart if you can still be able to communicate offline yet don't need to spend for buying additional hardware? We have these offline messaging apps that work on mesh network, Wi-Fi, Bluetooth and more and keeps you connected all the time. These apps let you communicate with each other within a close range, and some of the apps use Multihop technology that can extend the range greatly. These apps can be of great use while camping or jungle tracking or on airplane or cruise ship, wild life safari, foreign travel, mountains or places with intermittent or no coverage or in a remote area where there is no reception. Apart from these, it can be of great use in an adverse event when lots of people aren't able to communicate when it's needed the most. All you need to do is install these apps on your smartphone and you are good to go. 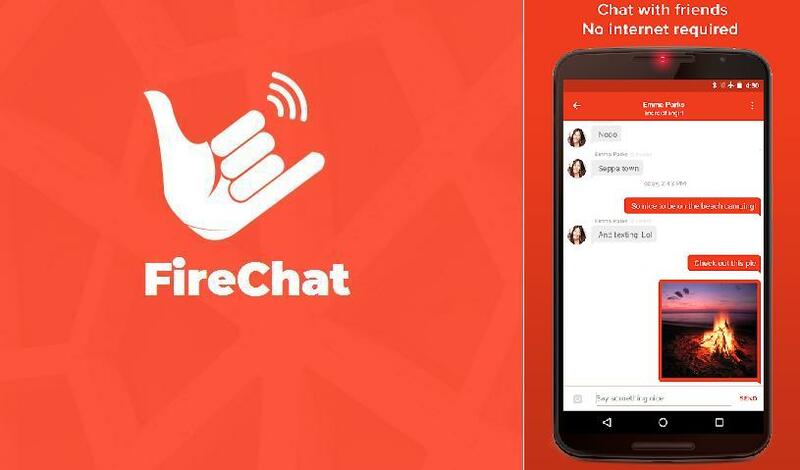 Firechat: Firechat comes from Open Garden, and it uses wireless mesh networking that enables your smartphone to connect via Bluetooth, Wi-Fi, or Apple's Multipeer Connectivity Framework. 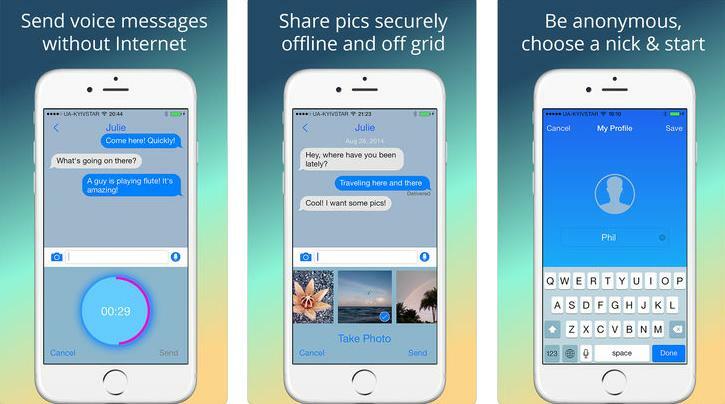 This peer-to-peer messaging app works with or without Internet access or data access to send text and images. 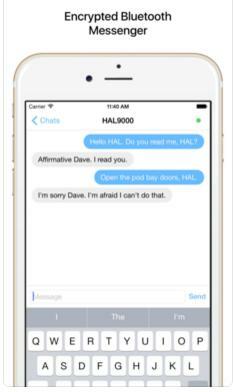 It allows you to send messages directly between mobile devices. It works by using the Bluetooth and WiFi radios in your smartphone to communicate directly with other devices within 200 feet that are also running Firechat. It uses Multihop technology and connects to all devices within range, creating a mesh network that even works when mobile and broadband access fails. You can create private groups up to 50 people; it works on iOS and Android devices. 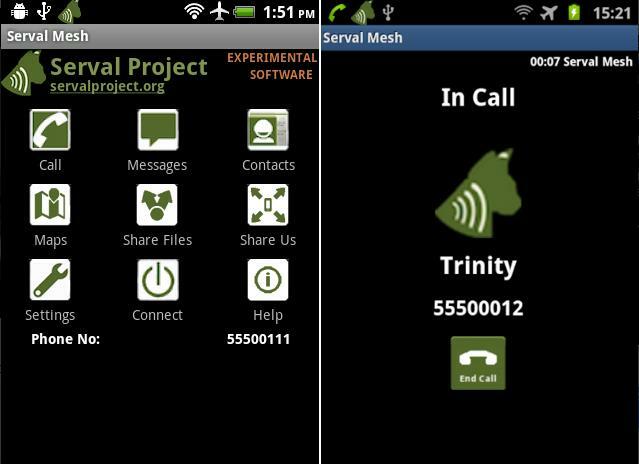 Serval Mesh: The Serval Mesh let's you communicate with other smartphones in your vicinity that are also running Serval Mesh by using your smartphone's Wi-Fi and Bluetooth. It's not dependent on your network, but for long-range communications you will still need to make use of network or fixed telephone networks or the Internet. It allows you to easily make private phone calls, send secure text messages and share files even when your network fails or is unavailable just about anywhere. It works only with Android. 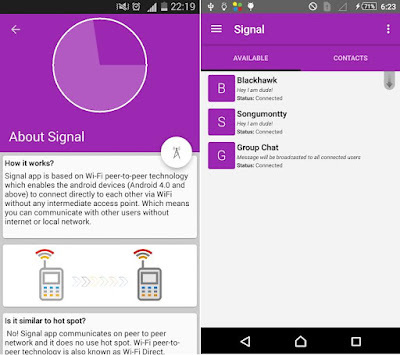 Signal Offline Messenger: Signal is a Wi-Fi Direct based offline messaging app that lets you communicate without Internet or local network in range of up to 100 meters. It lets you send audio, text, photo and video messages to smartphones running Signal Offline Messenger around you over Wi-Fi direct. Your messaging can be one-on-one or in a group. It works with Android. Vojer: Vojer is a peer to peer (p2p) messenger that creates its own secure and reliable mesh network around you for situational conversations. It doesn't require mobile 3G/4G or any other type of Internet connection, Wi-Fi routers, access points or any other infrastructure or intermediaries to connect peers to each other. It works with Apple iOS. Briar: Briar is a peer to peer (p2p) messenger, doesn't rely on a central server, the messages are synchronized directly between the devices. 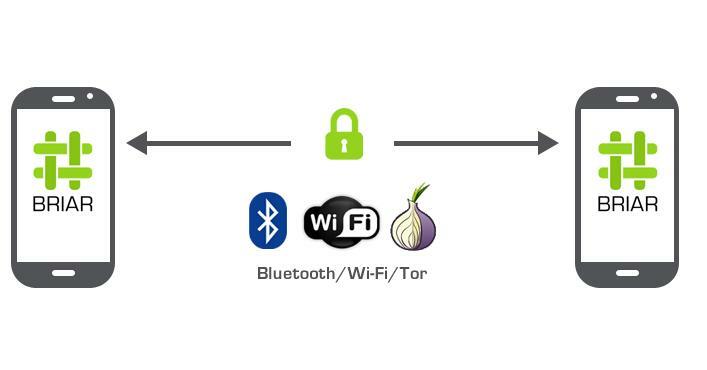 It can sync via Bluetooth or Wi-Fi, and also via the Tor network if the Internet's up. All private communication is end-to-end encrypted. It's designed for activists, journalists, and anyone else who needs a safe, easy and robust way to communicate while protecting them and their relationships from surveillance. Bridgefy: Bridgefy keeps you connected when Internet is unavailable. It works in three modes. Person To Person Mode: it uses your Bluetooth and lets you communicate with your friends that are within 330 feet (100 meters) of you. Mesh Mode: It works similar to the person to person mode, except you can also send messages to friends that are very far away. 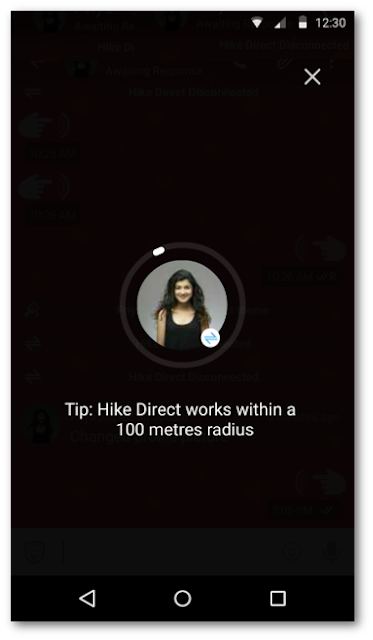 In this mode the messages and requests are shared by hopping on Bridgefy installed devices in the middle to achieve greater distances. And each hop can provide an extra 330 feet with ideal conditions. And this can go on to unlimited numbers yet your messages are safe and can't be read by those people in the middle. Broadcast Mode: In Broadcast Mode you send messages at very large distances between friends, also send out message to a larger audiences, just the thing you need for announcements, alerts and more. Hike: Using Hike Direct feature you can chat and share files with your friends within 100 meters of you without Internet connection. Jott Messenger: Jott Messenger is a Bluetooth-based messaging app and its especially popular with students. 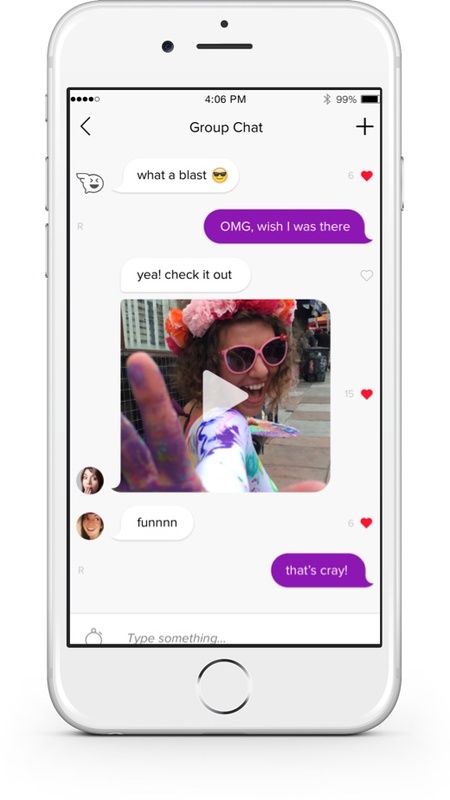 It lets you build and see the details of your classmates and friends at anytime. You can look up Snapchat, Instagram and Spotify usernames, see common interests and hobbies and get to know each other and make new friends. Another interesting feature is it automatically delete messages after a set time and notifies you if anyone takes a screenshot of your chat. It works with Android and iOS. Air Chat: Air Chat 4+ is a encrypted Bluetooth messenger that lets you send text messages to your nearby friends who are running the same app using Bluetooth without need of a data plan or Wi-Fi. As the messenger is Bluetooth based, the range should be apx 100 meters and it works only with iOS. 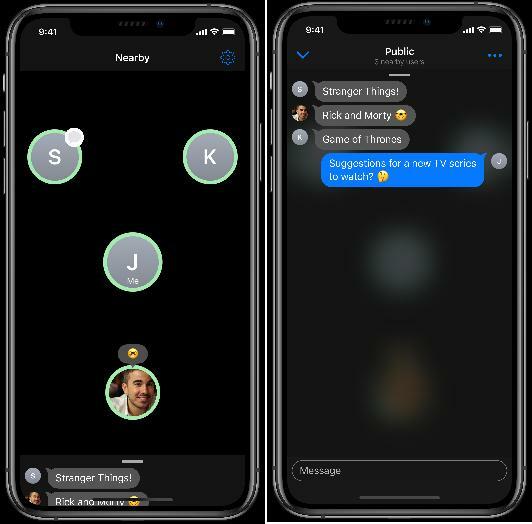 Berkanan: Berkanan is a P2P messaging app that works using Bluetooth and doesn't require Wi-Fi or data connectivity. The messages travel from device to device and let you chat with people nearby. It has some interesting features: if you move closer to the person whom you are messaging then their profile photo moves closer to yours, to the center of the screen. The public messages automatically disappear after 24 hours. It works with iOS.